This was a fun one! There were so many great medical moments and hilarious lines that it is no coincidence that this episode was written by Herself, Diana Gabaldon. Vengeance is Mine opens on Claire operating a makeshift dental clinic. With the resources available to healers of the time, most dental problems were treated by extracting the offending tooth. Aside from perhaps a shot or two of whiskey, teeth were pulled without anesthetics, sedatives or pain relievers. No novocaine, no nitrous oxide (laughing gas), no gentle topical anesthetic gel applied before the novocaine to avoid even the pain of the needle. Nope, these folks of the 18th century with dental ailments are desperate for help and tough as nails, knowing that if they can just tolerate the excruciating tooth extraction, relief will be forthcoming. This is in stark contrast to dental clinics of today which advertise painless dentistry with the aid of topical and local anesthetics, post-procedure pain relievers and even the option of sedation. The feared drill isn’t even always necessary any more as some cavities can be “drilled” with a rather painless laser. As lovely as that is, it doesn’t quite carry the same motivating weight when convincing children to brush their teeth! All joking aside, anesthesia really is an amazing advance and we are fortunate to live in this time in that regard! As Jamie and his men march toward Inverness, they camp along a river where Ross has the misfortune of impaling his own finger with a fish hook. We see Claire back the hook out of the skin along its path of entry, a method called the Retrograde technique. This works because this hook is smooth and lacks barbs that would otherwise catch and prevent it backing out easily. Rupert: Ah ye big baby, Angus’d bite it off wi’ his teeth. Fergus: Angus didn’t have front teeth. Rupert: He’d use his gums then. Most fishing hooks made today have one or more barbs which prohibit simply pulling the hook smoothly out the way it came. There are a number of techniques one can employ to remove a barbed hook depending on the type of hook. It can be very helpful to know the type of hook one is dealing with to better plan the removal. Various methods allow the backing out of a barbed hook avoiding further trauma, though at times the location and type of fishhook will require advancing it through the skin, cutting the end of the hook, including the barb(s), and then allowing the hook to be backed out the way it came. For multi-barbed hooks, it may be necessary to advance the hook past all of the barbs, cut off the eye of the hook, and continue advancing the hook out. I learned quickly to add a small pair of wire cutters to my first aid bag after my son hooked his uncle’s arm on his first try at fishing! Oftentimes, hooks can be removed in the field, though some embedded fishhooks cannot be easily removed or are in areas in which removal should not be attempted (in or near the eye!) and medical care should be sought. Ross: Tetanus. Never heard of it, but I’d take a shot of anything just now. Rupert: Sounds Spanish. Must be gin. Indeed, this is a risk she is all too well aware of and, as discussed when the tanner’s lad had his ear nailed to the pillory, there isn’t much to be done in the era before tetanus vaccination but cross your fingers and hope the odds are in your favor. Moments later, the Redcoats show up. That’s never good news. Oh Rupert, this guy just can’t catch a break. His dearest friend died in combat just days ago and now this! Rupert has sustained a gun shot wound to the eye. Fortunately, it seems that the bullet has remained in the eye socket or perhaps lodged in the bones of the orbit, but has not penetrated into the brain. A devastating injury, yes, but one that he will likely survive, so long as he avoids infection. Claire works to remove the bullet from Rupert’s eye socket and debride the area, or clean by removing dead or devitalized tissue and foreign matter, to allow it to heal. Rupert lies quite still throughout, despite the unimaginable pain involved. Again, the people of that time seem to have incredibly impressive pain tolerance! She sutures shut his now-empty eye socket and places a dressing over the wound. Claire: We’ll get you a black eyepatch and you’ll look a proper pirate. Claire: Along with peg-legs and parrots. Adventures in Medicine continue in this episode with one Miss Mary Hawkins, in the kitchen, with a knife. Having identified Danton, one of her attackers in Paris, she takes vengeance of her own. This one, though, is rather self-explanatory and doesn’t require much in the way of medical commentary! There was so much to enjoy in this episode – the development of Mary’s character, the reappearance of Hugh Munro, fun medical snapshots, humorous lines so reminiscent of the books, and Murtagh’s delivery of vengeance to the feet of Mary and Claire. I’ve read that Ms Gabaldon will not be writing a script for season 3 because it would take too much time away from writing book 9. This episode was truly a joy and hopefully we’ll see more scripts from her someday! Will the release of book 9 coincide with the premier of season 3? 2017 is promising to be a pretty epic year for Outlander fans! 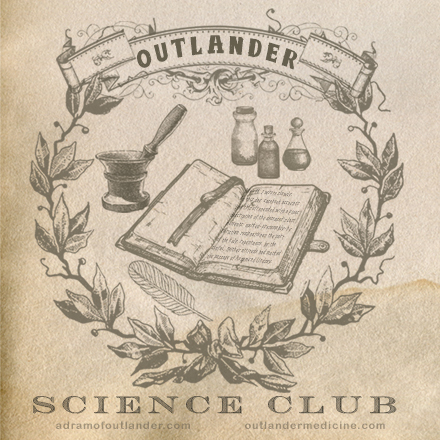 Questions, comments, concerns, or suggestions for future Outlander medicine topics? I’d love to hear from you! Leave a comment here, email or find me on twitter @sassenachdoctor!